Tiriel in 28 mm was one of the first HF figures ever released in 2004 and still remains popular today. This version is in 40mm scale and the combination of the extra height plus the crisp resin casting shows perfectly the fine details that Kev was unable to capture in 28mm scale. 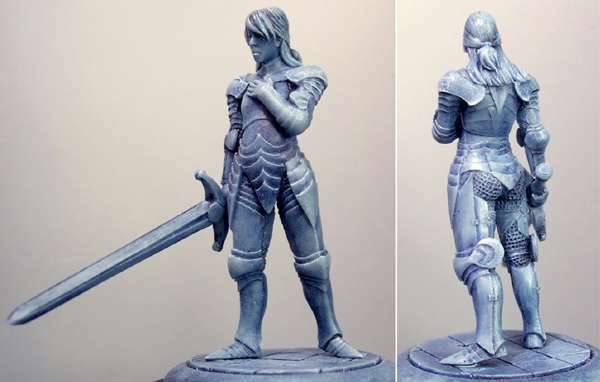 Cast in HF blue/grey resin, she is an excellent piece for painting with those clean armour lines but will also look lovely just assembled and put into a display cabinet (if you can't face painting her!). Tiriel is being used by many gamers who are either using her as a statue in a 28mm scale game or a figurehead for some of the 40mm skirmish games that are currently growing in popularity. She comes as three pieces...body, sword arm plus base.